This article provides a brief overview of neurotrauma, its classification and differential diagnosis, diagnosis and management. Neurotrauma is a common presentation in emergency departments across the world and is often an emergency situation. Patients who are not diagnosed and treated promptly can quickly succumb to comas and often irreversible damage or death. As such, a familiarity with each clinical diagnosis is needed and this article should provide the basis for that. We look at traumatic brain injuries (causing concussions, contusions and diffuse axonal injuries) along with bleed disorders like epidural hematomas, intraparenchymal hemorrhage, subdural and subarachnoid hemorrhages. A basic definition, pathophysiology and etiology is provided for each. Traumatic brain injury (TBI) is an injury to the brain that is due to external factors and neither due to degenerative changes nor due to congenital factors. This results in altered levels of consciousness and disturbed brain functions like cognition, physical and psychosocial functions. 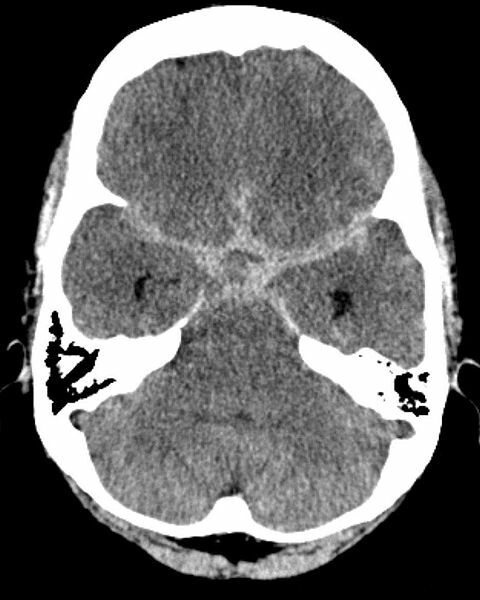 Trauma is a common presentation in the emergency department and can result in skull fractures and parenchymal injuries like a concussion, contusion, and diffuse axonal injuries. Traumatic vascular injury causes rupture of blood vessel and bleeding. Traumatic vascular injury can be broken down into epidural, subdural, subarachnoid and intraparenchymal injuries. Concussion is defined as a clinical syndrome of altered mental status secondary to head injury, typically brought about by a change in momentum of the head. Contusion is defined as a direct parenchymal injury to the brain. A Coup contusion injury is a cerebral injury at the point of impact (compact with brain tissue). A Contrecoup injury is a damage to the brain surface opposite to the point of impact. Clinically, these differentiations are not hugely important. Whilst it is good to know them, they are not correlated well with patient outcomes like recovery and are not used in discussing traumatic brain injury often. Diffuse axonal injury (DAI) is an injury to white matter caused by acceleration and deceleration of the head. Intraparenchymal (intracerebral) hemorrhage causes around 15% of strokes. Subarachnoid hemorrhage has an incidence of 9/100,000 per year. Patients are usually between 35 and 65 years old. TBI has a higher incidence among males as compared to females, occur at a younger age below 45 years, low socioeconomic groups, minority groups, unmarried, people with a history of substance abuse, and people with past history of neurotrauma are at high risk to receive TBI. Trauma can cause rupture of the middle meningeal artery which is a branch of the maxillary artery. This can be caused by a fracture of the temporal bone. The rapid expansion because arterial pressure can lead to transtentorial herniation. A subdural hematoma is caused by trauma leading to the rupture of bridging veins which go through the dura. As they have a low pressure, the hematoma can develop more slowly and presentation is chronic or subacute in many instances. Intracerebral, or intraparenchymal, hemorrhage causes around 15% of strokes. It is often caused by the rupture of microaneurysms (for instance Charcot-Bouchard aneurysms) or degeneration of deep arteries. Hemorrhage is usually massive and can be fatal. It is usually associated with hypertensive patients, although patients without hypertension can also have an intracerebral hemorrhage. These patients are typically older than 60 and the bleed often occurs in one of the lobes of the cerebral cortex. There is a genetic component to these patients, those with particular polymorphisms in the apolipoprotein E gene are at risk of re-bleeds and typically have a worse long-term prognosis. Traumatic brain injuries are concussions, contusions and diffuse axonal injuries. Pathophysiologically, traumatic brain injury and mild traumatic brain injury are complex syndromes and are not well understood. Classically, concussion has been separated from contusion (which means physically brain bruising) but its clinical use has come under question. Mechanisms of traumatic brain injury are varied and include diffuse axonal injuries where shearing causes neuronal cell death. Other mechanisms can include raised intracranial pressure from edema, hypoxia and ischemia. Concussions, contusions and diffuse axonal injuries will show a history involving a knock to the head and a period of unconsciousness or being “dazed”. They may develop headaches after the injury. Ask if they have any amnesia post-traumatically (i.e. do they remember the interval after the concussion). If they do not, this indicates a more severe traumatic brain injury and recovery is longer and more complicated. Patient history will include trauma of the head. There will often be a lucid interval. Make sure you consider epidural hematoma, especially if the patient was initially conscious after the trauma and has subsequently lost consciousness or is losing consciousness. Remember that epidural hematomas often occur via damage to the middle meningeal artery (MMA) behind the temporal and parietal bones. Patients will typically become worse, with more vomiting, a severe headache, confusion and fits if left to deteriorate. Patients can have contralateral hemiparesis and ipsilateral pupillary dilation. On examination, patients may have a cranial nerve III palsy which will show as the eye being in a “down and out” position. As mentioned previously, bridging veins tear and bleed in a subdural hematoma. History may be chronic (weeks) or subacute (days) as the bleed is slow due to the low pressure in the venous system. 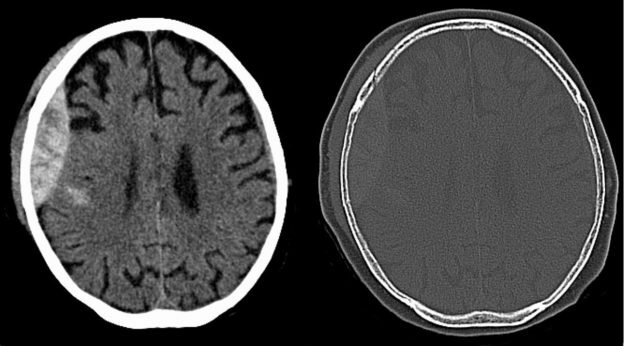 Consider a subdural hematoma in patients who have a fluctuating level of consciousness (as defined by markers like the Glasgow coma scale), even if the patient cannot remember significant trauma. Patients may suffer from seizures as the size of the hematoma increases. They can also have focal neurological deficits (so make sure you perform a full neurological examination including cranial nerves); however, this often occurs late on in presentation, many weeks or months after the original bleed. High risk individuals include the elderly, alcoholics and people with a history of blunt trauma. Remember – in the elderly, the patient may not present with a history of trauma and it is important to rule out a subdural hematoma. On CT, there will be a biconcave (often described as lentiform) and dense blood collection. This is typically caused by the rupture of a cerebral aneurysm. There will be an acute history, usually with a presentation of “the worst headache of my life”. On spinal tap, there will be bloody or yellow CSF. CT is the most effective investigation for diagnosis. Patients with hypertensive hemorrhage will show signs of stroke, but it is difficult to differentiate them from infarct strokes. Patients with an intraparenchymal bleed will usually have a very severe headache. If left, they are more likely to succumb to coma. CT is the main diagnostic factor in these cases. If intraventricular, intraparenchymal or subarachnoid blood is seen on CT, then a hemorrhagic stroke can be diagnosed. Instantaneous onset of transient neurological dysfunction. This can include loss of consciousness, temporary respiratory arrest and loss of reflexes. Patients may present with amnesia. If left, patients will have a decreased Glasgow coma score (GCS – a measure of consciousness) and suffer more headaches, vomiting until fitting and eventually they succumb to a coma. Death occurs if the coma causes respiratory arrest. Late signs to look out for include bradycardia and raised blood pressure. If left untreated, a subdural hematoma will gradually raise the intracranial pressure (ICP), resulting in herniation (typically tentorial) and coning. Histological section will show white matter axons swelling above their normal size. This is indicative of a diffuse axonal injury. Patients with mild traumatic brain injury recover quickly (they may have headaches, lack of concentration and other cognitive deficits for a few days to a week) but more severe traumatic brain injury can take months to recover from. A GCS below 5 at 24 hours post injury implies a serious injury. 50% of these patients die or go into a permanent coma. Some patients will not recover fully and will be left with cognitive impairment. Others may develop post-traumatic epilepsy or a post-concussional syndrome. This syndrome will cause patients to have dizziness, malaise and other vague symptoms. Management is supportive and rehabilitative in nature. Intracranial pressure monitoring and assisted ventilation can be useful in severe cases of TBI. Rehabilitation is wide-ranging and dependent on the specific symptoms of the sufferer. Neurosurgery is needed immediately. The patient will need clot evacuation and ligation of the vessel that is bleeding. 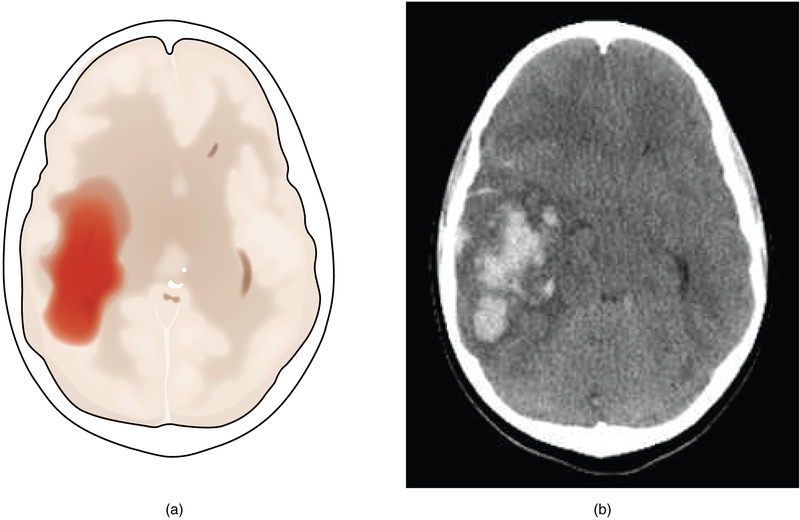 A subdural hematoma is relatively treatable compared to other bleeding disorders of the CNS. Typically, patients are sent for irrigation and evacuation using a burr twist drill and craniotomy to relieve pressure and remove blood. Under no circumstance should antiplatelet drugs be prescribed to patients suffering from hemorrhagic stroke. These are obviously contraindicated. In these patients, control their hypertension (if they have hypertension). Neurosurgical clot evacuation is the immediate first step, especially if patients are coning. The prognosis for traumatic brain injuries like concussions, contusions and diffuse axonal injuries is highly dependent on the damage they have caused. Good clinical indicators are a lack of post-traumatic amnesia and good Glasgow coma score (GCS) indicating executive functioning is intact. Patients with contusions (bruising of the brain) and diffuse axonal injuries (shearing and death of neurons) will typically have poorer clinical outcomes. Some patients may never fully recover from a coma if the TBI is severe. Others may die. Patients that do not enter coma, or wake up from coma post-TBI have poor outcomes. They can recover, but will often complain of post-concussive syndromes and give diffuse and non-specific cognitive symptoms like short attention span and headache. These are clinically difficult to deal with and patients may never return to “normal”. Depression is a common complaint amongst these patients. If the patient is identified and diagnosed quickly, then prognosis is excellent; however, patients that are in a coma and have pupil abnormalities pre-operatively do poorly. Again – this is a treatable condition and patients that are diagnosed quickly will do well. Mortality in subarachnoid hemorrhage is high in those with any of these signs: neck stiffness, cranial nerve palsies, and drowsiness etc. Patients in a coma that is prolonged, approach 100% mortality. Those that survive one month have a better prognosis, with 90% of them being alive at one year. This has a very poor prognosis. It can quickly cause death and is difficult to treat surgically or otherwise. Patients who do survive may have neurological deficits and need significant recovery – not all of which will be possible. Patients with mutations in APOE gene are at risk of having further bleeds. Le, T., Bhushan, V., Sochat, M., Sylvester, P., Mehlman, M. and Kallianos, K. (2015). First aid for the® USMLE. 1st ed. Longmore, J. and Longmore, J. (2007). Oxford handbook of clinical medicine. 1st ed. Oxford: Oxford University Press.